The end of wooden pallets, your project in complete safety. Your products are sensitive and handling operations must take place in a clean atmosphere. Your facility is certified IFS and BRC, and your operations are conducted in accordance with HACCP principles. Wood is prohibited in your workshops or those of your customers, you have replaced them with wooden, cardboard or metal pallets, but now your products slip on these new pallet types. CGP COATING INNOVATION provides solutions to your slippage problems. Anti-slip paper slip sheets provide an innovative response to the inherent instability of plastic, cardboard or metal pallets. 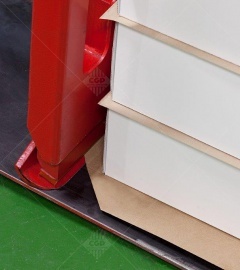 Our paper formats coated with an anti-slip solution ensure safe and secure palletizing and depalletizing operations.